SAWYER is a phenotypically complete package - long, clean-made, and correct when viewed from the side and thick-made and muscular from behind. 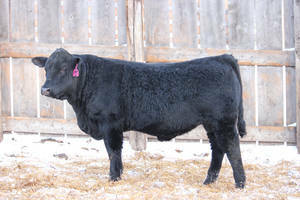 His dam has an average weaning ratio of 106 on 3 calves with an average birth weight of 81. She is also the grandmother of the powerful bull selling as LOT 88. His grandmother retired with 15 natural progeny and is also the grandmother of LOT 89. His milk EPD is among the highest in the sale offering and in the top 2% of the Salers breed. He is also triple-polled and smooth polled.